A. Yavuz Oruç is professor of electrical and computer engineering at the University of Maryland, College Park, MD. His research interests include interconnection networks, and parallel and quantum computing. 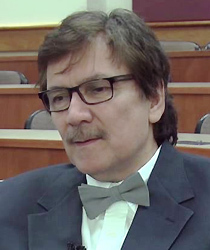 Dr. Oruç was an assistant professor in the Department of Electrical, Computer and Systems Engineering at Rensselaer Polytechnic Institute prior to joining University of Maryland in 1988. He served as the Director of the Computer Systems Architecture program at National Science Foundation. Dr. Oruç received his B.Sc. and Ph.D. degrees in Electrical Engineering from Middle East Technical University and Syracuse University, respectively. Dr. Oruç currently serves as the Associate Editor of IEEE Transactions on Parallel and Distributed Systems. but he does not have an affiliation with any professional society or organization including IEEE and ACM. ECE professor gives talk at Turkey's Suleyman Demirel University.